Gale Force Nine | SPACE-BIFF! 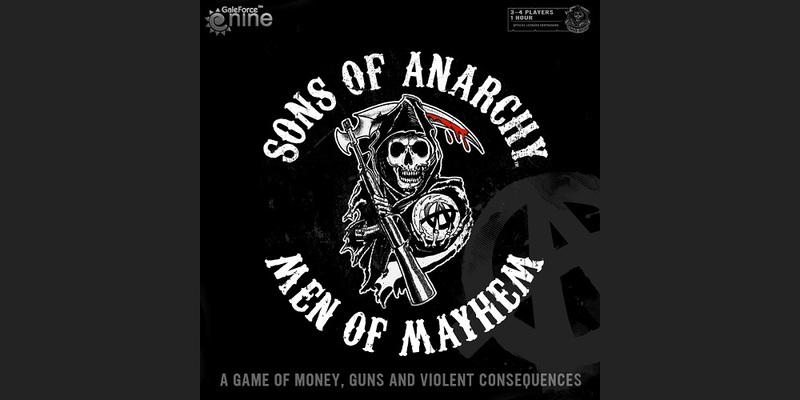 Sons of Anarchy: Men of Mayhem wasn’t a perfect game. Throwdowns, its fanciful term for when two grunting crews of motorcyclists settled their differences by any means other than words, were a colossal waste of everything but ego — which in hindsight was an entirely suitable, if accidental, commentary on stupid machismo. But like the rest of Gale Force Nine’s licensed catalog, it carried itself with enviable thematic cohesion, capturing the petty squabbles, unchecked greed, and hooting apeness of its source material. Contrast that against Vault of Dragons, the systematic sequel of Sons of Anarchy that transports the action from Charming, California to Waterdeep, Not California. Set in the world of Dungeons & Dragons, what thematic core does it capture? Tedium? An over-reliance on dice? Overburdened game systems? Because as far as I can tell, those are what Vault of Dragons values most. Lords of Waterdeep was pretty great, wasn’t it? Designed from the ground up to hit that sweet spot that would appeal to both newcomers to the worker placement genre and cardboard veterans alike, it saw widespread success for good reason. Anyone who said they didn’t like it was almost assuredly a walking diaper. A used walking diaper. Tyrants of the Underdark is looking to replicate that success. It’s even set in the same place, at least broadly — Skullport, the shady locale from the Lords of Waterdeep expansion, registers as a tiny blip in Underdark’s sprawling, uh, Underdark. This time, however, the target is deck-building games. And not just any deck-building game, but the chimera sort that splits your time between shuffling your cards and waging war on a map. Fifty years ago today — that’s either August 8th, 1966 or stardate 1513.1, depending on how much of a nerd you are — marks the first appearance of the USS Enterprise, as Kirk, Bones, Spock and the rest of the crew grappled with a mystery of hidden identity, a long-dead civilization, and a salt vampire. It was the moment that kicked off the series that would flop, get cancelled, become a hit, and spawn a thousand new episodes, movies, books, games, and imitators. The difficulty with adapting Star Trek to cardboard has always been that there are nearly as many ideas and topics that encompass the notion of “Star Trek” as there are episodes — that’s 726 across six television series, to be precise. Is it about exploration? Ethics? War? The power of communication? Teamwork? The answer to all of these is, at turns, yes. And many more besides. How do you capture the essence of something that has ambitions on nearly everything? Star Trek: Ascendancy, however, has not been designed by any old two-bit studio. This is coming from Gale Force Nine, the same people who captured the treachery and violence of Spartacus, the paranoia of Homeland, the tough-guy act of Sons of Anarchy, and the meandering twang of Firefly. And now they’ve done it again. By Grabthar’s Hammer, they’ve done it again. Except me when I tell you to trust no one, obviously. Gale Force Nine has been batting a thousand lately, which yes is a sports reference I understand because I’ve always loved badminton, thanks very much. So far, they’ve managed to nail the feel of each and every series they’ve acquired the license for, from Spartacus: A Game of Blood & Treachery, which captures all that show’s themes of corruption, backstabbery, and the reduction of people to playthings; to Firefly, which was about ramblin’ through space because Firefly the television show was about ramblin’ through space. Also smuggling cows. Now Gale Force Nine has acquired the license to Sons of Anarchy, television’s preeminent motorcycle-gang-as-Hamlet program, and this time they’re proving that they understand the series even better than the series knows itself. For one thing, Sons of Anarchy: Men of Mayhem never transplants its motorcycle gangs to Ireland in search of a kidnapped child, because the board game version has the sense to know that’s a stupid and boring thing to do. Instead, the board game knows how to have fun, every second, all the time — so let’s take a look at my top five fun moments. If I were to place myself on the Firefly/Serenity Bias Scale™, I’d be a firm 7 — a far cry from the “biased against” minority down at the bottom, a bit above the “no bias whatsoever” score of 5, and not quite the eerie devotion of those who rate a 10. I’m telling you this because the new Firefly board game, from the same designers behind last year’s lauded Spartacus: A Game of Blood & Treachery, has been landing quite a few positive reviews (and a couple negative ones too) on the basis of its nostalgia factor. Does that seem right to you? I mean, I think it seems perfectly fine, since the game is about emulating the feel and spirit of the television show and movie, but if you’re at all like me — as in, you roll your eyes ever so slightly at that twangy intro theme and some of the more out-of-place western affectations, and really could not give a flying hump about someone’s Summer Glau themed DeviantArt account — then maybe this is the review for you.